In his speech to the Durham Miners’ Gala on Saturday, Ed Miliband was keen to emphasise that he was there to honour the past – to honour the tradition of the Gala itself, of the North East and of the labour movement. He was ‘humbled by the history’ of the Gala, and by the list of Labour leaders who had addressed the meeting and in whose footsteps he was ‘proud to follow’. So, is this a return to ‘old’ Labour? Was Miliband ‘cosy[ing] up to his militant, left-wing union paymasters’ and ‘handing his party back to Kinnock’, as Baronness Warsi put it? First, it is worth noting that relations between the Labour Party and the miners have often been far from cuddly, as Kinnock knew only too well. His appearance in 1984, during the miners’ strike, ended in humiliation, with most of the audience walking away while he was speaking. In 1969 a BBC documentary picked up on the way in which Labour leaders were called to account at the Big Meeting. It showed Harold Wilson at the 1969 Gala, sidestepping questions about whether a planned new power station in the area would be coal-fired and Barbara Castle arguing that change was ‘by definition’ part of Labour politics, while acknowledging that her audience would be at the sharp end of that change. This was just months after the publication of ‘In Place of Strife’. Even in 1947 when Hugh Dalton announced the nationalization of coal, the Durham Advertiser reported that his speech was met with ‘stony silence’ – Labour’s plans stopped far short of the miners’ demand for control of the pits. Second – and again, contrary to popular perceptions – New Labour did not dissociate itself from its history altogether; it just became selective about the parts it was willing to claim. As I have argued in my new book, even Blair was relatively comfortable with invocations of Labour greats of the past – especially the distant past. Keir Hardie and the Rochdale pioneers were all drafted in to legitimize his political project and, crucially, to allow him to distance himself from the controversies of the more recent past. This is where Miliband’s speech gets more interesting. He didn’t stop with distant history, but instead sought to draw parallels between the divisions of the 1980s and those of the present, casting them as an example of the ‘same old Tories’, creating another ‘lost generation of young people’. Even more interestingly, it is these sections of Miliband’s speech which the Labour Party website chose to quote – precisely the divisive history from which New Labour sought to distance itself; not the more anodyne tributes to Labour’s ‘traditions’. But this is not 1984 or 1994. The Labour Party, the country and – indeed – the Big Meeting itself, have all changed. As others have noted, Miliband’s appearance in Durham came in the same week as his praise for Tony Blair at the Labour Party Sports Dinner. 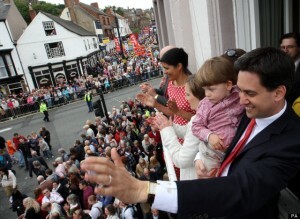 Apparently Miliband felt there was a ‘synergy’ between these two events – glittery New Labour and grittier old Labour. It is only by reconciling both these pasts and focusing on the opposition outside the party that Miliband feels Labour can rebuild itself. The message is not one of returning to the past, but of moving on from it. In any case, there is no unchanged past which can be recovered, as the recent history of the Miners’ Gala itself demonstrates. From being ‘bigger than Christmas’ in the inter- and post-war years, it declined in the 1960s and ‘70s, as the pits began to close. It was only in the early 2000s that old banners were resurrected, new ones commissioned and numbers exceeded anything that had been seen since 1960. But this couldn’t be a simple return to the past. Instead, it was a quite deliberate and self-conscious attempt to use a sense of shared heritage to reassert local identities and, perhaps counter-intuitively, to heal rifts that continue to divide villages and neighbours in the wake of the 1984-5 miners’ strike. Carol Stephenson and David Wray have called this process ‘emotional regeneration’ and emphasised the extent to which it revolves around the memories of the strike itself. In their view, the revival of the Gala would not have happened ‘had the closure programme been allowed to follow the piecemeal and largely uncontested process that was the norm, pre-Thatcher.’ It was the need to overcome the trauma of the 1980s which made it necessary to reclaim and redefine the past. Heritage here is cathartic. When you see people marching past as I did from the balcony of that hotel, a march people have been doing for 140 years, I think that it is not just about politics, it is about the strengths of these communities.